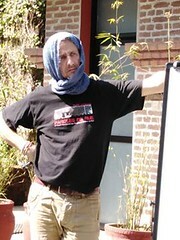 On the occasion of the celebrations of the 10th and 25th anniversaries of the ROCQTR (Association of Community Organizations in Quebec for Street Work) and ATTRueQ (Association of Street Workers of Quebec), Canadian member of Dynamo International – Street Workers Network, a 3-day seminar was held in Quebec. This important event for street social workers in Quebec gathered more than 200 participants on September 17, 18 and 19, 2018 at the Montfort Hotel in Nicolet, Quebec. This gathering of street educators and outreach workers and their coordinators from across the Quebec province was also an opportunity to attend conferences and working groups, and hold the general assemblies of the participating organisations. Strong emphasis was put on the international dimension of this event, with the presence of Mathilde Dufranc, coordinators of Dynamo International – Street Workers Network from Brussels (Belgium) and Benito Cignac, coordinator of the Haitian platform PLANATRUCH (PLAteforme National des Travailleurs de Street and Community of Haiti), also member of the international network. ATTRueQ has also been working for many years in Haiti, and especially in Jacmel, on social inclusion through art and culture. A 75-minute presentation, given by Francis Lacharité, Quebec coordinator of Dynamo International – Street Workers Network and Mathilde Dufranc, aimed to make Quebec workers aware of the importance of the international dimension in their daily practice. The idea was to mobilize their energy to interact and exchange with their peers abroad. 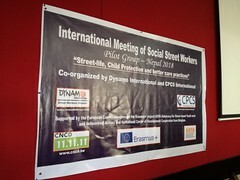 Benito Cignac, coordinator of the social street workers platform in Haiti PLANATRUCH, also presented the situation in his country and more specifically, the legal framework for the intervention of street social workers. Sylvain Fillon, street social worker and director of the NGO Tous les enfants de l’autre monde also drew up a picture of the living conditions of children in street situations in Peru. All these activities highlighted Quebec’s central role in the internationalization of the street social practices. … along with a projection of the travelling photographic exhibit “Travailleurs de rue, Tisseurs de liens” lauched in Brussels in May 2018.